The weather was hot; it was over 100°. In my view, that is perfect ice cream weather. Now, my diet plan (admittedly, not a very thorough one, though it serves double duty as a budget plan) decrees that I only buy ice cream when it is on sale. Fortunately, there was an amazing sale on a kosher brand with a scrumptious sounding flavor. We (I) scooped it up and made our way to the checkout where we were informed that we needed a supermarket card to get the special sale price. We do not live in Dallas. The supermarket chain does not exist where we do live. We did not want to stand at a customer service desk to get a card. The store, for a reason that eludes us, doesn’t allow the checker to swipe his own store card. I don’t pay full price for ice cream. Stalemate. That is, until the checker turned to the woman behind us in line and asked if we could use her card. She immediately said yes and told us that she had been in exactly the same situation while visiting her daughter in S. Carolina. The problem was solved and the ice cream was delicious. That should be the end of the story, but it got me thinking. That kind woman’s willingness to share her card would not necessarily be a universal response. A number of years back, researchers dropped wallets in shopping malls around the country. In some cities, almost all the wallets were turned in to mall security, in others almost none were. There are places in the world, and I daresay places in the United States, where people are trained to be wary of strangers. Instead of helping each other, the first reaction is, “Why is this person talking to me?” or “What are they trying to put over on me?” Unfortunately, there are enough rogues out there who seek to repay friendliness with theft, and as they increase, human interaction suffers. In addition to that, in socialist societies, a direction in which we are sadly moving, citizens are encouraged to betray one another even as the ruling class mouths platitudes of compassion and comradeship. A few months back, I was shopping at Costco. I love Costco and have been a fan ever since I discovered it over twenty years ago in Seattle. Leaving my Issaquah and Kirkland Costco stores was one of the prices of moving to the east coast. I quickly found that my new Costco wasn’t quite the same. Not only did I no longer enjoy stunning views of Mt. Ranier and Lake Washington during my drive, but the shelves weren’t stocked as well and the employees weren’t as cheerful and solicitous. Still, what was on the shelf was familiar, trusted, and well-priced. Nonetheless, I was completely taken aback at my last visit. On a previous trip, I had purchased frozen peas. A few weeks later, I received numerous phone calls and letters telling me to please discard the (huge) bag as there was a health concern. I threw out the peas, and when I returned to Costco a month or so later, I put a replacement bag of peas in my cart. I told the checker that this was a replacement at which point he leered at me and sneered, “Right, yeah, you threw out a bag like this.” I have to admit that I was breathless at his insulting assumption that I was lying. Now, Costco could have sent a certificate for a replacement bag in the letter informing me of the problem. But paying for a new bag wasn’t the point. The interaction drove home to me that I wasn’t in Kansas anymore (technically, Kirkland, WA where the company is based) and what I had perceived as the ‘Costco spirit’ didn’t travel to another location. Not surprisingly, I have pared back my membership and only sparingly shop there now in contrast to the Washington locations which served as pleasurable as well as utilitarian outings. The two shopping experiences reminded me that much of what we take for granted, that makes everyday life enjoyable, rests on shaky foundations. Common courtesy can easily become a rare commodity and smiles can quickly transform into surliness. As more of us spend increasing amounts of time with technology rather than interacting with our fellow humans; feel betrayed by the government that is supposed to serve us; and obsess on our rights rather than our responsibilities, we take yet another step along a path leading to a less pleasant future. 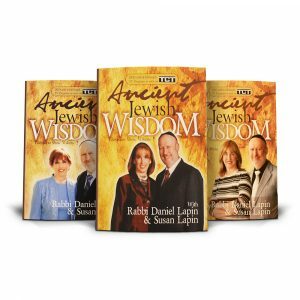 Don’t miss our summer sale on The Ancient Jewish Wisdom TV Show Set. My husband and I love taping this show and now you can own 12 shows for an amazingly low price! Methinks your Southern pride is showing! Once upon a time I was about to move into the Washington, DC area to accept a new job with a government agency. My boss-to-be cautioned me off-the-cuff not to move into Maryland: Technically part of the South, Maryland in spirit was no different from Delaware and the Northeast. Virginia, he told me, is much nicer, for the folks are courteous and gentile, like the South. Hmmm, I thought. The one year my family spent in Maryland confirmed his opinion. Visitors from Europe that we have entertained also comment that our Southern sales clerks are so unexpectedly courteous and friendly. There must be something to it. The Yankee can think of us what he bloody well pleases, but life in the so-called Bible Belt is not all about prejudice, intolerance and ignorance as he supposes. It is gentility and harmony, as well, which also has roots in the Bible. Our Costco down here, by the way, is just like the one you left behind! There are obviously wonderful people and terrible people in all places. But there are different cultures, some of which encourage friendliness and kindness and others that discourage it. We do get affected by where we live. Now, that was funny! Cheeky, even. Ha! Here, in the left ventricle of the Heartland …or is it considered the right ventricle?.. anyway, that person behind you would have offered her card without being prompted. Although, the cashier would have also had a card set aside just for such an event, the person behind you would get the priority option since it works benefit them also by adding points to their card. Hm – now I have no idea where you are. Perry Stone did an interesting observation about the United States of America’s layout being in the pattern of the The Tabernacle. For example, the placement of the bread basket in juxtaposition with the table of shewbread, Texas placed in the vicinity of the oil lamps, California and the golden alter, and so on. It all seems a bit lofty, but if we all considered it being so, how much more would we take care as well as consider each thing we did as in the service and worship of God? I am where as (the heart) goes so does the nation, Ohio. I am curious if people in Ohio are praising or upset with Gov. Kasich for his anti-Trump actions and statements. In a more diplomatic translation of my mom’s sentiments, Kasich should be awarded a hat with bells on it for not even considering the position the Indiana Governor Pence was gracious, and wise, enough to have now secured. I get not wanting to run with Donald Trump, but it seems as if Kasich has been on a bit of a vendetta regardless of how that might help Hillary. I think it worked out all for the best anyway. Now, I can’t think of a better running mate for Trump. And, no matter how you slice it, I don’t think there’s any help for Hillary, that she doesn’t already have anyway. What I mean is that Trump has room for improvement. I just don’t know if he has the humility in him to realize that and take advantage of it. I’m pretty sure Hillary has is totally depraved in that area. If should be elected after all, I can only hope that I’m proven wrong about her. Humility coupled with strength – wouldn’t that be an amazing combination.